The Hybridge Full Arch Dental Implant Bridge and Full Mouth Restoration Protocols are solution-based options that replace all of the teeth on either the upper jaw, the lower jaw, or both. Many patients arrive having had their natural teeth already removed, while others are just starting to evaluate alternatives to their natural teeth. If the natural teeth still remain, a thorough exam and consultation with a Hybridge Certified doctor will determine if replacing the natural teeth is an appropriate option. Once the decision has been made to replace all the teeth in one or both jaws, three dental implant treatment alternatives are available. The Hybridge Full Arch Treatment Protocol permanently replaces up to 12 teeth in either jaw, supported on five or six dental implants, in as little as three to 16 weeks. Full function and esthetics are restored, resulting in a long-lasting and healthy alternative to compromised teeth. As a rule, the Hybridge Full Arch Protocol requires that any remaining upper teeth must be removed and the jaw must heal for 11 weeks before the six dental implants can be surgically inserted. We refer to this as a two-stage process. Temporary teeth will be inserted on the same day of the extractions so that there is never a time when a patient will go without teeth. Once healed, a computer-generated surgical guide is made to plan the best locations for the implants in a precise manner. 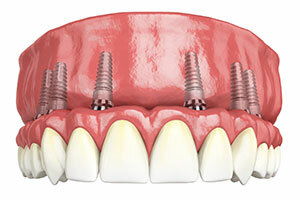 With extreme accuracy, the dental implants can be surgically placed, typically with a minimally invasive technique. Once the implants are inserted, the Hybridge Laboratory creates a single restoration that not only replaces the teeth but the gum line as well. The materials used to make the Hybridge Full Arch are dependent on patient needs. 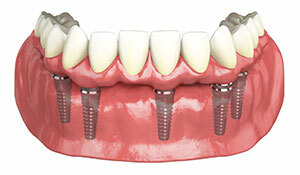 The Hybridge Full Arch treatment can be finalized within 5 weeks of implant placement. The total upper treatment can be completed from start to finish in 16 weeks. Typically, the Hybridge Protocol for the lower teeth has only one surgical phase. Unlike the upper, the extraction of the remaining lower teeth and the surgical placement of the dental implants can be done in the same appointment. At the end of the surgical visit, temporary Hybridge teeth will be inserted immediately so that there is no time when a patient will go without teeth. Hybridge Express offers a temporary Hybridge, which can be securely attached just like the final Hybridge Full Arch. It can be inserted within the first 24 hours. 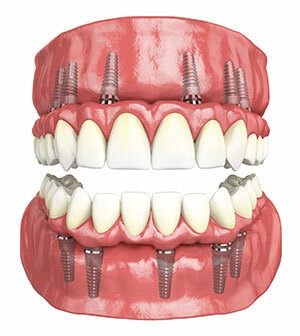 Once the dental implants are in place, treatment can be completed is as quickly as 5 weeks. Many patients choose to have their entire mouth restored at the same time with Upper and Lower Hybridge Full Arch. There are many advantages to having them done simultaneously. Efficiencies exist when working on both jaws at the same time, resulting in reduced appointments, decreased cost, and the ability to idealize esthetics and tooth position. The typical treatment time is about 16 weeks. Again with this Protocol, there is never a time when a patient will be without a beautiful set of temporary teeth. The Hybridge team is keenly sensitive to a patient's need for comfort during the Hybridge process and the expectation that the process is completed in as short of a period of time as possible. A written treatment outline is provided so that Hybridge patients can be aware of what the treatment sequence of appointments will be, as well as the timing between each appointment. Once complete, the Hybridge Full Arch provides fully restored function with unparalleled esthetics. Natural smiles are created using the finest modern materials. There are three alternative materials available that are used to make a Hybridge Full Arch—acrylic, Prettau Zirconia ceramic, and cross-linked PMMA. Each of these different materials has its own set of indications based on a patient's habits and history. A Hybridge Certified dentist will decide which the best option is. Once Hybridge treatment is complete, there are some recommendations that are important to follow in order to guarantee a long-lasting result. Every Hybridge Full Arch comes with a night guard to wear for protection of the new teeth at night. Although most patients deny clenching and grinding their teeth at night, many in fact do so on occasion. The night guard will prevent wear and chipping of the materials due to grinding. There are certain foods that are to be avoided with your new Hybridge restorations. Anything that requires crushing (ice, hard candy, hard nuts), or tearing (tough breads, taffy) should be avoided. With a little common sense, Hybridge Full Arch should be able to provide long-lasting function with minimal maintenance required. Patients should expect some minor repairs and maintenance over the years. This will vary from patient to patient depending on their habits. The Hybridge Full Arch can be resurfaced as needed depending on wear and tear over the years. Upon completion, daily hygiene instructions will be reviewed so that proper daily care can be done to maintain ideal oral health long term. A hygiene recall program will also be established at 3-4 month intervals so that a Hybridge professional can periodically clean and evaluate the health of both the restorations and the oral tissues. Periodic x-rays will also be taken to check the status of the dental implants and the health of the bone and gum tissues. In addition to our standard Hybridge Full Arch solution, the discovery and use of new materials in the field of dentistry over the past 10 years, such as Zirconia, has opened up an opportunity for those patients who may not have been a good fit for a full arch procedure. We're also excited to introduce our own patent pending advancements in the area of Full Arch Implant Dentistry that we have been developing over the past couple of years. As we lead the way in implementing new and improved methods that continue to elevate patient care, we have been able to create new solutions for patients who may not otherwise be able to take advantage of these life changing full arch dental procedures. To learn more about either of these specialized solutions, please follow the links below. We are proud to introduce Hybridge XD (Express Digital), now the most efficient and simple digital protocol available to patients for full arch restorations. Just how simple is it? Hybridge’s patent-pending breakthrough requires only one appointment after surgery, shortening the entire treatment process down to just two weeks from implant placement to your final full arch prosthesis. So, while everyone may leave the office the day of surgery with temporary teeth, with Hybridge XD, our patients are also completely done in as little as two weeks. There have been many significant advancements in dentistry that dentists would consider to be game changers. One of those advancements was the discovery of Zirconia as a dental material. Over a decade ago, Zirconia was introduced to the dental world as a ceramic material intended to be utilized for the fabrication of Zirconia crowns and Zirconia bridges. Prettau Zirconia is one of three materials available for Hybridge full arch restorations depending on the treatment recommendations of your Hybridge Certified dental implant doctor.